Description: Devlin Stead grows up a lonely orphan in late 19th century Newfoundland. When he begins receiving letters from the esteemed but mysterious explorer Dr. Frederick Cook, they entirely change his understanding of who he is and what he might become. Invited by Dr. Cook to become his apprentice, Dev eagerly heads for New York City, where he is introduced into society and joins his mentor in epic attempts to reach the North Pole before Cook’s archrival Robert Edwin Peary. When Dev is thrust into international controversy, he must master a series of revelations about his family that will determine his fate. In spellbinding prose, the author of the acclaimed Colony of Unrequited Dreams recreates the romance, the politics and the peril of the legendary race for the North Pole. 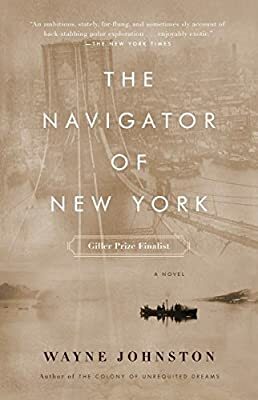 Brilliantly rooted in history, The Navigator of New York is a fascinating exploration of the quest for discovery, and how it is remembered.